The upper traps have gotten a bad rap in recent years and training them directly has become somewhat of a fitness no-no. But for athletes and lifters who are stuck in spine-extension based postures and can’t raise their arms overhead, training the upper traps can be a game changer for overall shoulder health and performance. The key? Ensure they’re trained with upward rotation. The ability to elevate your arms overhead is important, whether you’re an athlete or just an accountant who hits the CrossFit box several times per week. The thing is, many people have lost the ability to bring their arms overhead without using some major compensation patterns. For the non-athlete, the fix is simple. Foam-roll the upper back, work on anterior core strength and thoracic endurance, and perform correctives like bench T-spine mobilizations. Then “cement” the pattern with strength exercises that nudge you into more extension, like goblet squats or front squats. But what happens when we have a person who’s not a bent-over computer guy, who’s at the opposite end of the spectrum and is stuck in more spinal extension already? This is common and has its own set of problems. Mostly it has to do with underactive upper traps. To elevate the arms overhead, the shoulder blades need to go through three movements: posterior tilt, protraction, and upward rotation. And the three muscles that work together to perform those tasks are the serratus anterior, lower traps, and upper traps. Not the rotator cuff. Here, unlike computer guy and his overactive upper traps, the athlete’s upper traps tend to be underactive/lengthened and will need a healthy dose of upper trap activation along with lower trap and serratus anterior work. This is when a lot of guys start salivating. Their brain turns to sugarplum thoughts of barbell shrugs and superhero traps. Not so fast. In this case, barbell shrugs are one of the last things they should do. Sure, barbell shrugs target the upper traps, but what happens when you shrug 300 pounds and then return back to the starting position? 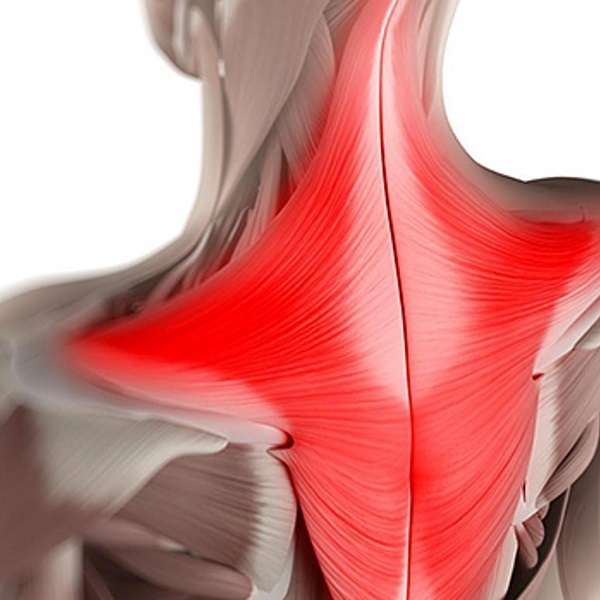 You place the upper traps on stretch and encourage the very thing we’re trying to avoid – shoulder depression. Not only that, but traditional barbell shrugs work scapular elevation, not upward rotation. If you have the ability to elevate your arms overhead without compensating through the lumbar spine, this is an excellent option. Here you’ll want to brace your abs hard, keep the ribs down, and start with the barbell overhead. From there, shrug upwards, making sure to use a controlled descent. The objective here is to “press” the rope overhead and then to add a slight shrug (reach towards the sky) at the top to better engage the upper traps. The whole time you’ll want to resist the extension moment of the weight pulling you back. This exercise will also hammer your core. This is more advanced than it looks. There should be no extracurricular movement via the lower back or with the head protracting forward. The more upright the torso angle, the easier the exercise is. Strive for quality here. End with the arms in a “Y” position at a 135-degree angle (which also better targets the lower traps) and then add a slight shrug/reach at the top end of the movement. Control the descent! For those people who don’t have the ability to go fully overhead, the landmine is a versatile tool because not only can we target the delts, we can also do so in a way that includes more upward rotation of the shoulder blades. Start in a half-kneeling position to better control pelvic and ribcage position. As you press up, try to “reach” at the top. The “reach” is crucial. Not only are you getting some great upper trap activity, but more importantly, a ton of serratus activity. Push-ups are great – when they’re performed the right way. But many athletes tend to keep their shoulder blades “glued” together during a push-up, and that’s not doing their shoulders any favors. The shoulder blades should move around the rib cage during a push-up. It’s a mistake to keep them retracted (pinched together) the entire time. Instead there should be little protraction at the top. This ensures a little more serratus activation, which will undoubtedly help with improving upward rotation and allowing the shoulder blade to move. You can progress the push-up to a yoga push-up where we add a hip hike and “reach” at the top to target even more serratus as well as upper traps.